Calling all romantics, this love-themed badge would make the most perfect handmade Valentine's gift. It is a 25mm white badge with two red love hearts. It is simple but romantic. Our badges look great pinned to your coat/school uniform and just add that little extra sass. 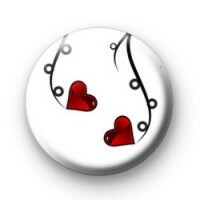 With hundreds of love, cupid and romantic badges to pick from we are positive we have the perfect badge for you. We even have a selection of Anti-Valentines badges for people that are sworn off love.